Weren’t things simpler in the olden days? When you walked down to the grocery store, naturally taking your time to peruse the shelves and procrastinate over the week ahead. You might be enjoying a nice chat at the till. And there. The store owner looks out the window and sees it’s raining, grabs an umbrella and picks up your shopping bags. He leads you out into the rain-drenched car park, bags in tow and fills the trunk of your car, carefully ensuring that not a drop of rain touches your head. You’d politely discuss the weather, he’d smile and fill you in on the latest local news. You wave goodbye and continue on your way. You’ll go back to that store next week because you liked it there. That grocery store had nothing that the other shop down the road didn’t have, but they didn’t acknowledge you existed. There were no chats, no helping hands. They didn’t anticipate your needs or make you feel special. That delightful era of customer support is making a comeback — and its resurgence in its new context is really exciting. Social media brings forth a community. With a community there lie great opportunities. To succeed at customer support on social, by building a community around your brand, there are a few things you need to remember. Before we begin, first remember that you and your customer are human. A successful strategy will empower your agents with tools that grow a loyal following, by responding faster with personalized experiences, which in turn will leave a long-lasting impression on your customer. Where are your customers interacting with support? First, let’s identify where your customers are interacting with your support team. By analyzing customer behavior and understanding their expectations, you will discover when and where you and your agents need to be. 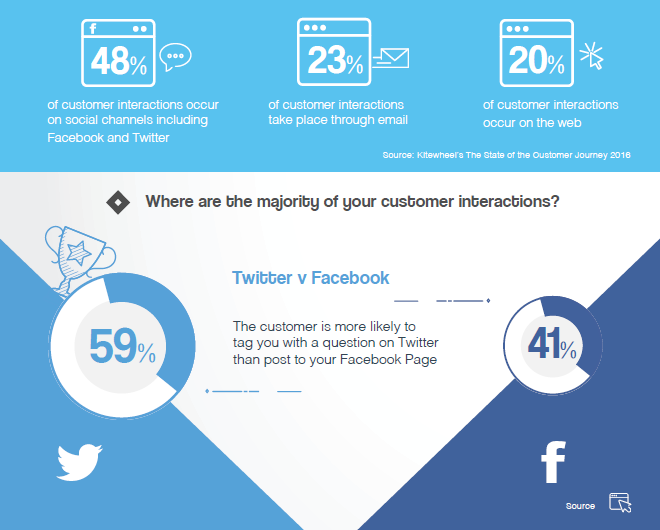 The majority of customers expect a response on social media within the hour. Unfortunately, studies show that the majority of businesses are failing their customers by not providing effective support on the platforms that they interact with their company most — social media. Only 36 percent of consumers who raised an issue on social media received a satisfactory response. 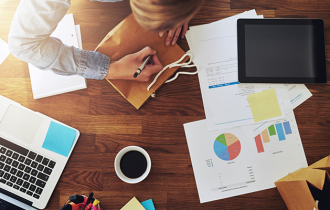 Although it may seem like an arduous task to satiate the ‘always on’ customer’s demands on your support resources, by the time you scan the infographic, you’ll effortlessly breeze through to a successful strategy. Everyone loves a good story, whether it’s a tale of wonder or woe, you can bet on your customer sharing their experience. Unfortunately the less desirable stories are shared twice as often as the positive stories. Humans love to share. It’s up to you to ensure that you maintain and enhance your reputation. When companies engage and respond to customer service requests over social media, those customers end up spending 20 to 40 percent more with the company. 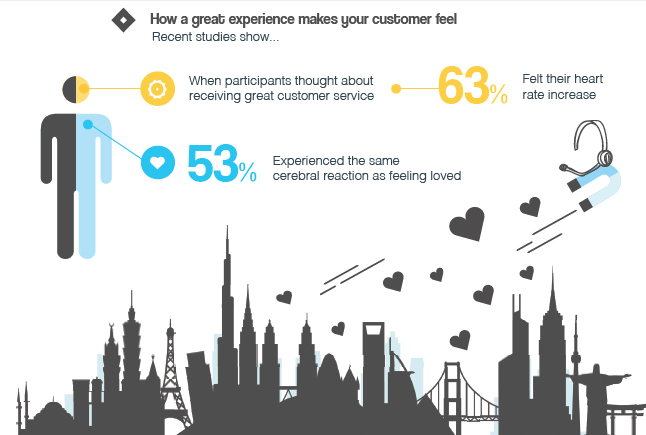 Not only that but studies show that the act of receiving a great customer experience triggered the same cerebral reaction as feeling loved. The results reveal that if you implement a social support strategy now, you are likely to beat your competitors to win the hearts of a loyal customer base. Let me give you some pointers for winning at customer support on social. Let’s talk about etiquette. Be there for your customer, respond quickly and anticipate their needs. Recognize your customer and treat them like and individual. Build a relationship — be honest and listen. Be consistent — establish tone of voice for your company. Help your customer where they are; try not to direct them elsewhere. If your customer contacts you on Twitter, they don’t want a number for a call center. If they want speed, let them know that you are listening. Respond faster, and if you don’t have an answer, assure them that you are working on a solution. Whatever you do, don’t ignore your customer. Anticipate your customers’ needs like a real friend might; like the owner of that grocery store would. Treat each person with respect. Personalize your customers’ experience. Use first names when interacting with customers online. Mutual appreciation on social is developed like any other relationship. Look after your customer and they will happily look after you in return. Be honest with your customer and stay true to your company’s identity. Build a level of transparency to establish authenticity and a mutual trust with your audience. Transparency will help you and your agents to speak with more confidence. Be open and responsive. Establish a tone for your support conversations. Your tone of voice should be consistent across all communications with your customer, whether it is on social or over the phone. Characterization of your tone will humanize your brand and allow you to have natural flowing conversations. Show empathy. It is important to listen to your customer, so that you can understand and deal with the query effectively. A consistent tone gives your customer a unified impression of your business’s personality across all channels. Consistency is essential to establishing trust. It allows the customer to engage with your brand on a deeper level and they will feel an affinity towards the company. Decide why you are there in the first place. To educate, to entertain? To inform, to sell? Who does your brand sound like? Imagine your company as a character and then flesh out its personality. What is the general sentiment of your brand? Define the traits of your brand — are you personal, factual, honest, direct? What language do you use in communication? Short and simple, or detailed?Serious or lighthearted? Once you have established your company’s tone of voice and an understanding of social media etiquette, then it’s time to solve the challenge of handling queries across multiple channels and marketplaces. How do you manage the volume of requests from the ‘always on’ customer? When you’re under pressure with marketplace SLAs and customer expectations of a near-immediate response on social 24/7, how can you fulfil their needs and avoid suspension from marketplaces for missing a response deadline, let alone avoid spoiling a hard-earned reputation? We’ve been listening to online sellers and understand the difficulties faced when managing a myriad of marketplaces, social channels and points of contact with your customer. Top performers in social customer support are 92 percent likely to recommend that you enable your agents with a fully integrated system that includes all the information and interaction history for their customers on one screen. 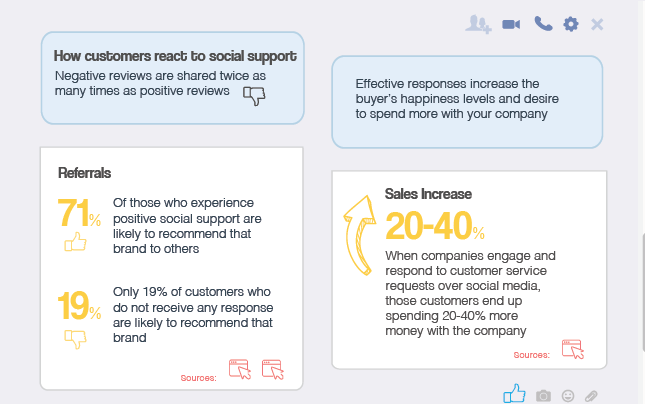 Here’s how the businesses who are succeeding at social customer support are surpassing their goals. 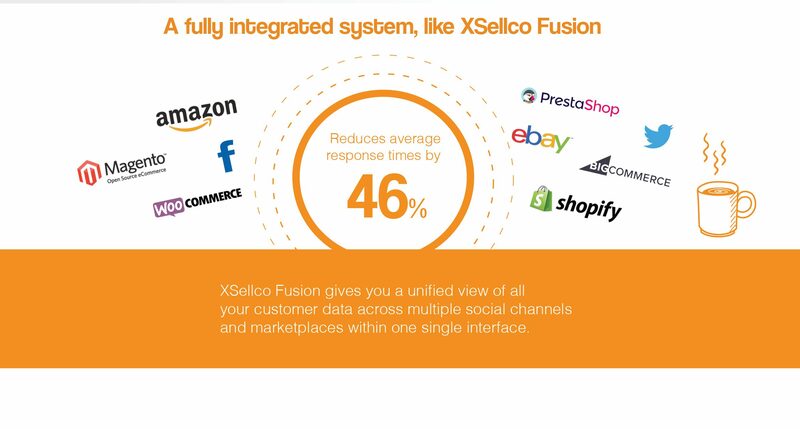 xSellco Fusion gives you a unified view of all your customer data across multiple social channels and marketplaces within one single interface. 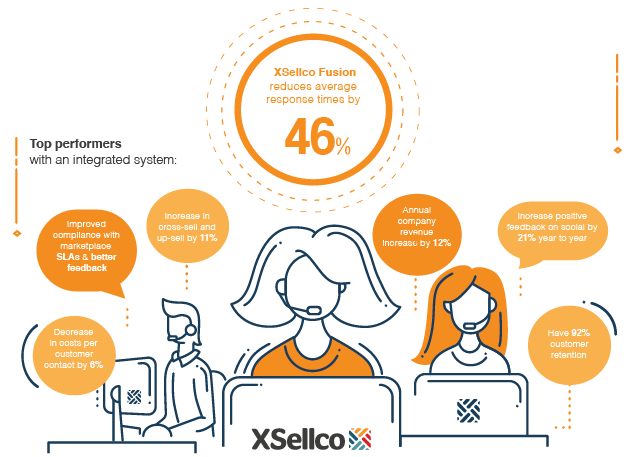 Our insights reveal that Fusion speeds up your response times by 46 percent when you streamline multiple channels into one centralized system. 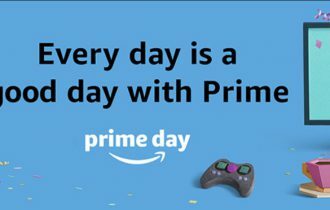 The system’s features empower your agents to keep track of resolution times, enhance customer metrics and avoid Amazon suspension with faster responses. While supporting multiple marketplaces and channels with numerous logins, Fusion also provides support for foreign speaking buyers. Your company has visibility on agent productivity and the ability to see when support agents are overloaded. This simplifies the coordination of your agents across your various channels. 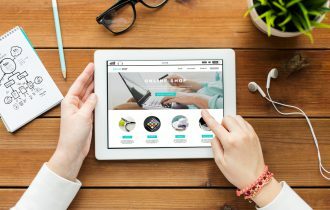 It is important for online sellers to understand customer sentiment in order to improve their experience and increase sales. A great takeaway from Fusion is that you can analyze customer insights, historical interactions and learn from behavioral trends to improve efficiency and grow your business. Top social support performers with a fully integrated system have 92 percent customer retention and are increasing positive feedback by 21 percent year to year. The infographic below reveals the countless rewards that benefit businesses with a fully integrated system. If you analyze your customer behavior and react to evolving trends, you will grow your business with the help of your loyal following. Listen to your agents — with their close relationship to the customer, they can provide you with valuable insights. With an integrated system for managing all of your support requests on one screen, you can easily achieve a successful multichannel support strategy. 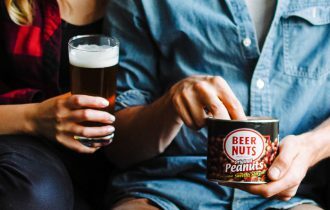 Combine that with an awareness for the rules of social etiquette and a solid tone of voice, you will be giving the idealized grocery store owner a run for his money.